Technology can be addictive. When my children pick up a device they become completely zoned-out. Do you find yourself arguing with your kids over video games, the tablet or TV? Dealing with kids and screen-time can sometimes feel like a challenge because we have little parenting example to follow from our childhood. This topic has become an ongoing parenting discussion at our house. 1. Set a daily limit. Check out this brilliant, but simple suggestion from Sports Mom. She writes. “These sweet boys are surrounded by electronics that are hurting their minds, crushing their creativity and killing their social skills. Really, it’s just so easy to pick up an electronic. It takes no thought. It takes no effort. I decided to revert back to a system I used when the kids were little: Electronic Tickets.” Read the full post. She offers her boys an hour of screen-time a day. Loved the post. 2. Or don’t set a limit, set a barter system. You know your child better than anyone. Sometimes setting a limit on something makes things even more attractive to a child. 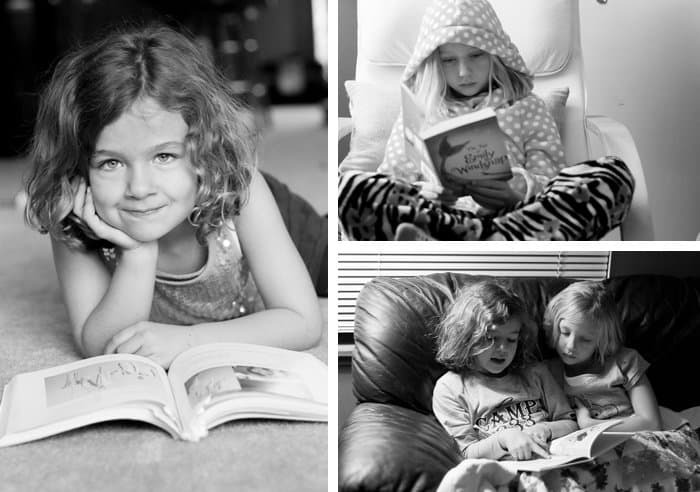 At our house, we trade 15-minutes of reading for 30-minutes of screen time. The reading is required BEFORE the screen-time and there is no limit on how much you can read. This simple approach has helped our family create a good technology balance. You’re not alone. From toddler temper-tantrums to tweens talking back … how do we get our kids to cooperate? One of my ongoing goals is to continue to work on having parenting tools in my pocket for these type of stressful parenting situations. Which is why I am excited to be partnering with affiliate Amy McCready, founder of Positive Parenting Solutions & TODAY Show contributor, who offers FREE LIVE training affiliate webinars. You’re in luck. There is another webinar this month! If you’re tired of nagging, reminding and yelling to get kids to listen – this session is for you. Discover proven tools for your most frustrating discipline dilemmas including the 5 R’s of Fair & Effective Consequences. This hour-long investment will leave you with ideas you can start using the SAME day. All you need is your computer. (No webcam required.) You’ll see and hear Amy on your screen and you can even ask questions and she’ll make them part of the presentation. 3. Define what ‘technology’ means. Before you put any limitations on technology, you need to ask yourself, “Does that include TV time? Does it include playing games on the wii when the kids are up and active? If you do include TV time, does that include a movie that you are watching together as a family?” Be sure to have a clear definition before putting solutions into action. Check out this post from One Creative Mommy, she uses a technology token system with her children. Read the full post. 4. Create a list of unplugged activities. 5. Carry an ACE in your pocket. I agree that offering your kids awesome activities is a great way to inspire them to be screen-free, yet sometimes it feels unrealistic. We don’t always have time to walk our kids to the park or go bowling. I admit, screen time is an easy default when you feel like you’re going to hit that breaking point. You know what I mean, right? That moment when you simply need 20 minutes to yourself to finish a project, get dinner started… find your sanity. You’d think the smile captured below is what would make me *love* Tinker Crate, but it’s not. THIS is the face that wins me over time and time again: She does this sweet thing with her lip when she is concentrating and enjoying herself. I needed 20 minutes to find my sanity. Tinker Crate scored me 45. Tinker Crates are geared for kids age 9-14+ who enjoy hands-on science, technology, and engineering exploration. Pop over to their site to peek inside one of the crates. 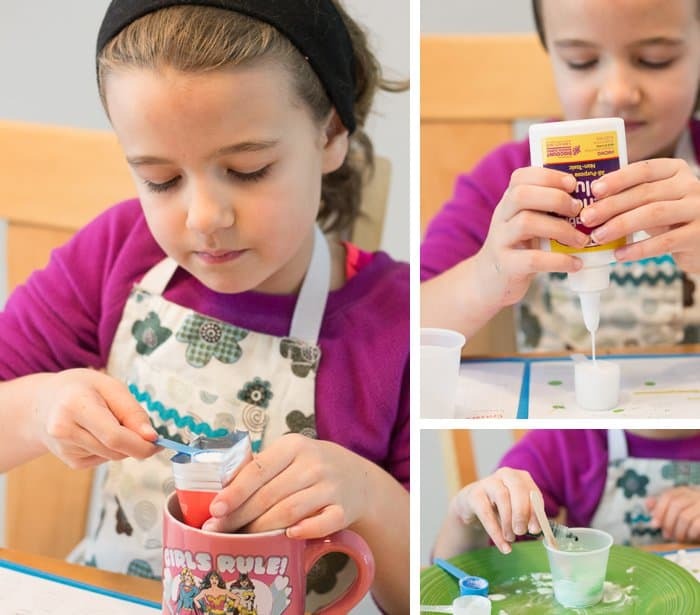 If your child is more crafty, check out Doodle Crates. 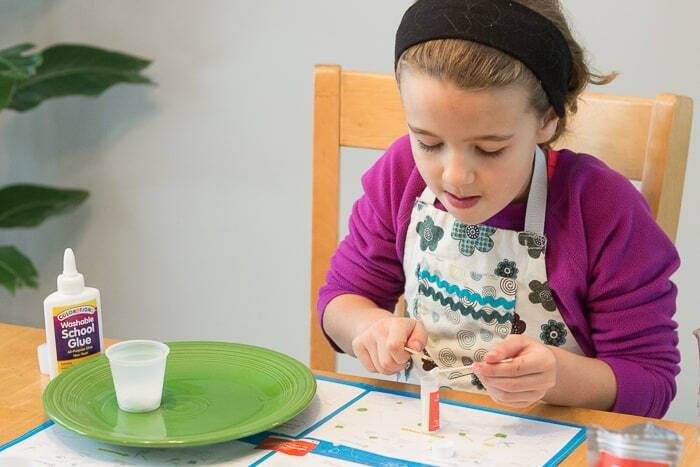 These DIY project crates are geared towards kids 9-16+. 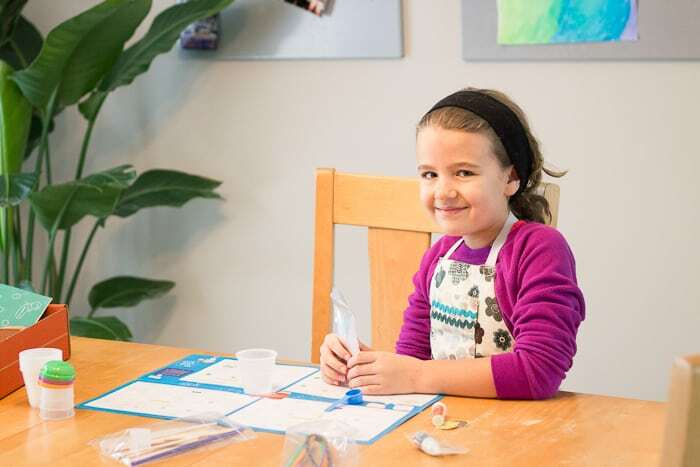 Check out some of the current DIY tween projects. If you’ve got a little one on your hands, check out Kiwi Crate (ages 4-8) and Koala Crate (ages 3-4). We started with Kiwi Crates when the girls were younger and loved them. Having a ready-to-go crate on-hand is a perfect alternative to screen time in a pinch. 6. Take a look at your own habits. 7. Set standards for the future. We need to remind ourselves, “I am a role model for my child when it comes to technology.” When using your smart phone, keep this in mind. For example, if you don’t want your child to turn into a teen who checks text messages while you are speaking to them, be sure YOU don’t check text messages when your child is talking to you. Look at your behaviors and ask yourself, do I want my child to do this when they are a teen? How often are you checking Facebook during the day? If you get a text during dinner, do you continue your conversation with your family or stop to see what it says? Don’t accidentally put yourself in the category of — Do as I say, not as I do. In the end, I think it is also important to remember that technology is not going away. 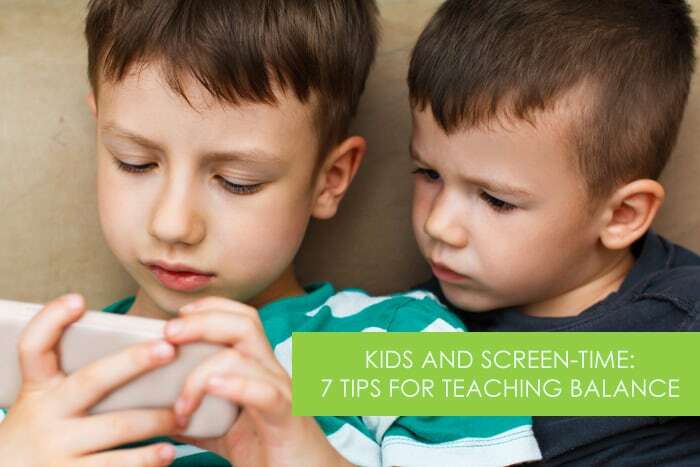 There are so many articles out there about how to “limit” your child’s screen-time. In my opinion, those types of articles often miss the mark. 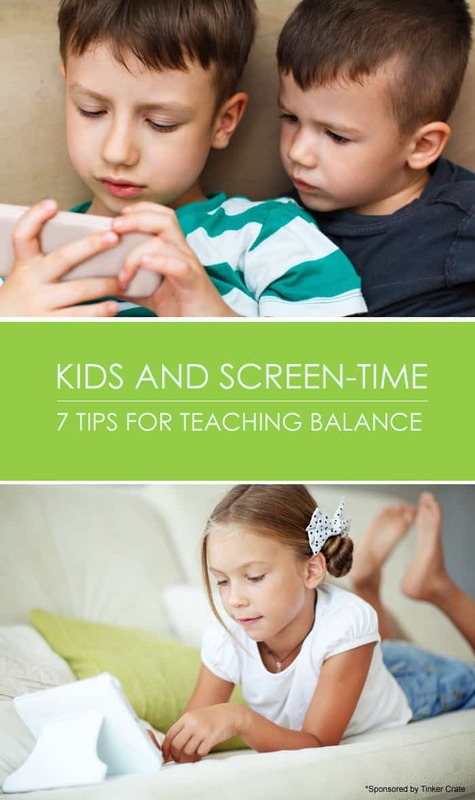 Really, when we are talking about kids and screen-time the discussion needs to be, how do we teach our kids to find a healthy balance? How do you do find balance at YOUR house? I’d love to chat in the comments. This is a great article. My favorite is number 5, making a tinker crate. Thank you so much. I LOVE this article. Between cold weather and dropping naps, screen time has increased at my house. And I know better (don’t we all). The barter system is a good idea and I like reading exchange for TV so that there is a natural balance. I love that idea so much — I will do that when my son is older. And I love the idea of technology tickets as well. Can’t you just see a difference in your kids on days they got a little too much screen time vs. days they play outside all day? It is about balance and also teaching them how to use it responsibly. This is something I seem to always be thinking about. I just have to say – this is a great post in terms of addressing kids and screen time. I found this over @ http://affimity.com/#/sharedPost/2/9228 and I plan to share it all over. I have heard so many parents proudly say ‘my child NEVER watches tv,’ and that’s good! However, I am not a terrible parent because my kid does! The setting limits works for us: 1 hour of adventure time in the morning, 1 hour at bed. Sometimes, a cartoon movie if it’s a rainy day (but those are great days to make towers from blocks, mom!). Bartering almost never works because my son’s developmental delay keeps him from actually understanding half of what I say, so limits are a life saver. I am definitely going to take note of your craft ideas; thanks a bunch! We have really struggled with this issue in my household, but we’ve finally got a solution that is working for us. My parenting mantra is choice within boundaries. So this is what we did: first, I set the boundaries. My kids have six hours on the iPad and 5 shows to choose per week (these numbers will go down when school starts). Technology doesn’t start before 10:00 am and must end by dinner. No more than two hours at a go without an equally long break. My son just turned seven, and my daughter five. My boy can totally navigate this system independently, and my daughter needs a little help. The iPads have codes on them, and I remind them to start the timer when I enter the code. When they are done, we check the timer and I write down what they’ve used. We add it up together (bonus math practice). This may sound complicated, but it has greatly simplified things in my house. I set rules I can live with, and they are in the drivers seat regarding when they play. My kids will always ask about plans for the week, so they will choose to skip using screens on active fun days to save time for days with nothing going on. It has also ended all battles and whining over screens. We’ve been using this method since summer started and it’s been beautiful. This is a challenging issue, and I applaud any family working towards balance.